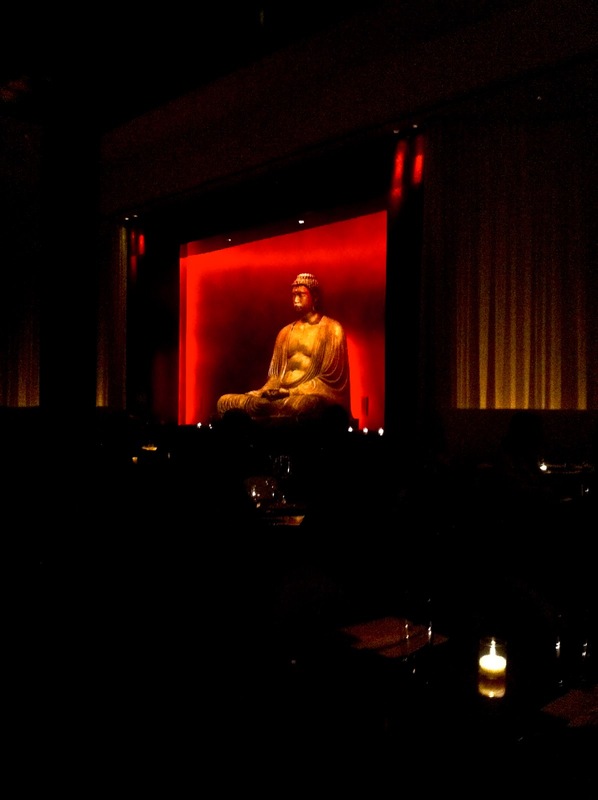 Buddakan, another restaurant in the STARR Restaurant group (Pod, Alma de Cuba) has a wonderfully dramatic ambiance. I grow increasingly appreciative of Stephen Starr’s talent as we try more of his restaurants and look forward to trying as many as possible of his 27 of so locations in Philly, NYC, Atlantic City and Florida. 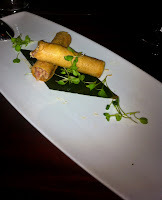 Buddakan must be one of his most successful undertakings as he has opened Buddakans in NYC and Atlantic City. Tuna Tartare Spring Rolls, Kobe Beef Satay, Edamame Ravioli, Black Cod and Wasabi Mashed Potatoes are some of the dishes we shared. The “Dip Sum” Doughnuts were a sinfully delicious dessert. I suppose we could try out NYC's Buddakan for lunch tomorrow. Train travel in this north-east corridor of the U.S. is astounding. We could walk to Philadelphia's 30th Street Station, also known as Penn Station, and get to NYC in 1 1/2 hours max. Arriving at New York City's Penn Station we would take a cab or an easy walk to the Meat Packing District and Buddakan. Then back to NYC's Penn Station and return to Philly by late afternoon in time for another great dinner in Philadelphia. New York's original Penn Station is no longer.... The original structure (1910-1963) was, according to my husband, and from all the pictures I have seen and articles I have read, a breathtaking and monumental entrance to New York City. Today there is still much angst over the demolition of the terminal building. Where there was once a beaux arts masterpiece and an architectural jewel, there is now a boring office complex and the Madison Square Garden arena. Penn Station is now completely underground. On the positive side, the controversy that resulted from this tragedy prompted immediate conservation efforts and probably saved NYC's Grand Central Terminal from demolition. So we do not make the train trip to New York this time - we must leave for home this afternoon. And alas, now I would be too depressed on arrival into New York's Penn Station. So we instead opt for brunch at Farmicia; and try to pare down, just a tiny bit, my son's food expectations with a simple but delicious goat herb omelet, breakfast quesadilla, and bagels with lox and eggs. Visiting our son at college has turned into an eating frenzy. He is tired of college food already and so when he hears we will be in town his stomach starts growling and he starts prowling the Philadelphia restaurant and foodie sites. Pod is right in the heart of "University City" and consequently attracts a young crowd. During the dinner hour it is quite loud and very busy, just perfect for its clientele of graduate students, young teachers and perhaps the occasional undergrad group out for a special night. The very hip (I am so dating myself with this language) décor reminds me a bit of the Jetsen’s TV cartoon show; but in a good way - I loved that show. The ultra modern, red, u-shaped, couch-like, plastic looking seating "furniture" (I’m exhausted even describing the lounge) where we waited for a table would have been very uncomfortable but it was not, and it provided a perfect area where you could be a bit separate with your own group but still feel part of the larger crowd. We started with Miso soup and Sushi, moved on to Kobe Beef Skewers, a Cauliflower Robata and Shrimp Pad Thai. All were good and artfully presented. The chocolate bread pudding for dessert was excellent! I am sure we will be back many times over the next few years.